Klintberg & Way Automotive (KWA) official Importer for Dodge & RAM brands, announces the arrival and full availability in Europe of the new Ram 1500 Rebel. 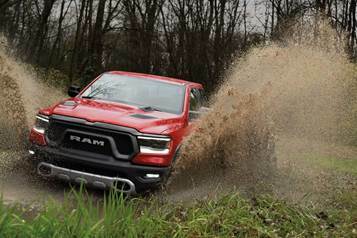 Based on the all-new 2019 Ram 1500, the Ram Rebel brings off-road capability to the full-size truck segment with unique design cues and off-road components backed by Ram Truck engineering. Equipped with a factory lift, locking rear differential, 32-inch tires, Bilstein shocks, skid plates, tow hooks and other off-road-ready features, the Ram 1500 Rebel appeals to the truck owner looking for a less-beaten path. Off-road aptitudes that meet the most advanced technology, high-end interior details and comfort features as a direct response to market demand. Official KWA dealers have the additional opportunity to offer to US car enthusiasts, the Rebel 12 pack, a special package available on all Rebel cab and color configurations, that brings new technology and premium features in this rugged high-performance truck. In terms of technology, Rebel 12 pack offers the fourth-generation Uconnect system that includes enhanced processing power, multi-touch gestures, vivid imagery, sharper graphics and the ability to support smartphone integrations. The class-exclusive, 12-inch reconfigurable touchscreen display offers split-screen capability and tailor-made graphics. Owners will appreciate the finest audio system Harman Kardon with 19 premium speakers, 900-watt surround-sound amplifier, 10-inch subwoofer and active noise cancellation. Rebel 12 pack also features leather-trimmed interior with heated front seats and unique metal speaker grilles trimmed in the Rebel’s signature Radar Red anodized finish. BFGoodrich Tyres Off-Road technology lands in Ireland!